How’s this for unexpected? Variety has just revealed that Eric Bana has signed on to play Elvis Presley in the new flick Elvis & Nixon. For some reason, I would’ve never pegged Bana as the Elvis Presley type, but now that the casting’s been made, I can sorta picture it! Last time someone portrayed Presley in a high-profile way was when Jonathan Rhys-Meyers won a Golden Globe for the 2005 TV mini-series Elvis. It’s this movie’s premise that’s the real source of intrigue here, though. 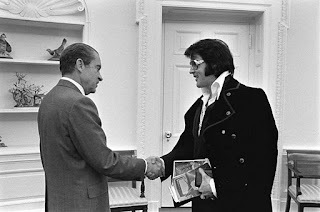 Apparently, in 1970, Presley wrote a detailed, six-page letter to President Richard Nixon, requesting a meeting with him. Presley had the notion that Nixon should appoint him “Federal Agent-at-Large” in the Bureau of Narcotics and Dangerous Drugs. Would anyone really trust The King of Rock ‘n Roll with that position? Well, ok, maybe Nixon would. Presley and Nixon did in fact meet - on December 21st of that year - but unfortunately Presley did not secure the federal agent job. No hard feelings though. The King brought Nixon presents - including a Colt 45 pistol (ya can’t make this stuff up) - and showed him family photos during their brief encounter. Nixon reportedly found the whole thing totally awkward. Danny Huston is set to portray Nixon in the film, and The Princess Bride star Cary Elwes is making his directorial debut. This bizarre tale seems primed for a big-screen retelling. I certainly had no idea this strange meeting ever went down, but I’m completely and utterly amused that it did. Contest: Win a Copy of the New Steve McQueen Bio!